The first site is in the Central Oregon high desert. 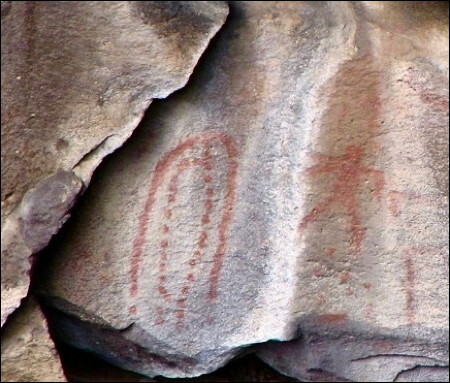 The two symbols on the left (one inside the other) are cave (hollow rock) and completeness. 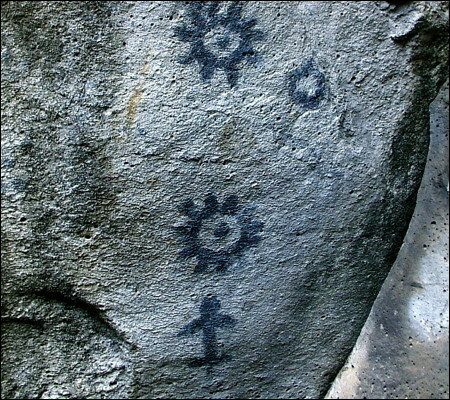 The symbols are located near the mouth of a lava cave, and the combination indicates that one becomes complete in the cave. Unlike completeness symbols at other sites I have visited where the symbol is only about the vision quest itself -- the ceremony makes you a complete person -- this completeness symbol serves a triple purpose. Not only does it mark this spot as a vision quest place, it also replaces the usual second line inside the rock symbol that means that this is a hollow rock, or cave. In addition, it indicates that the ceremony here involves making a complete walk through the cave to another entrance and then back to this entrance (the easiest way out). The completeness symbol is often referred to as a completed circuit. Note that the symbol is painted with dots or moccasin prints, indicating walking. The symbol on the right is the starting-off symbol. The lowered right arm says this way is blocked, and indeed it is a dead end. The double arm on the left says that this is the way to go through the hollow place (again, a double line), and back again. The black and white photo is an aerial shot of the two entrances. 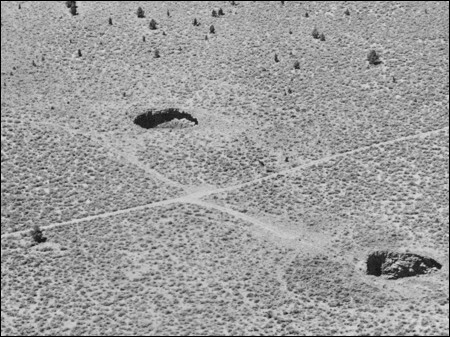 The second site is near Tule Lake in northern California, and also located near the entrance of a lava cave. The stick figure symbol at the bottom is the sitting symbol (lowered arms, legs in resting position), and the rising suns show the passing of time. The dot in the center of each sun specifies that the passing of time happens here, in this place. Another photo shows a friend sitting in the vision quest chair which is located directly below the symbols. The circle (an open eye) is a locater symbol meaning to look this way for more writing. It points to other symbols in the cave that tell the story of the Supernova of 1054 that created the Crab Nebula. 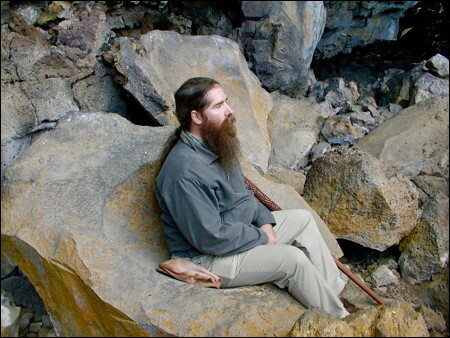 Imagine sitting in the stone chair on the last night of your vision quest. As the sun rose, the stars blinked out, except one which flared bright in the curve of the crescent moon. That star remained visible in the daytime sky for three weeks, and in the night sky for two years! There are two sites near Tule Lake that document the event, and several others throughout California. 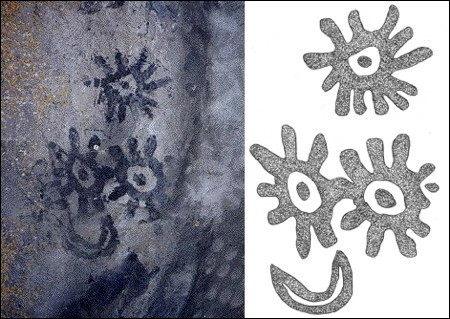 The last image shows a photo and drawing of the Supernova symbols.